This listing is for a gorgeous, custom-made French mattress cushion handmade to your specified dimensions and in your choice of fabric (pictured here in a lovely steel grey cotton velvet). Your mattress cushion will be handmade with the greatest care and attention to detail in our small Northamptonshire workroom, using traditional hand-tufting techniques and completed with a stunning hand-quilted French mattress edge. Constructed in high quality upholstery grade foam with a further layer of dacron wadding and stockinette to prolong the life of the foam and mattress, these beautiful cushions are detailed either with upholstered buttons or cotton tassel tufts along with a quilted edge hand-stitched in extra strong thread to ensure a professional and durable finish. So thrilled with this pretty French cushion pad for our kitchen window seat. Thank you Jo, it is perfect! This is gorgeous cushion. Made to measure and fits my kitchen bench perfectly. Excellent quality and looks fantastic! In the first instance please do get in touch directly if you are not completely happy with your purchase. I will always try to resolve any issues you have and work out a way for a satisfactory outcome - I want my customers to be 100% happy! Within the UK small items such as scatter cushions are usually shipped via Royal Mail Signed For First Class post, with international items going via Royal Mail International Tracked post. Larger made to measure items will be shipped using a specialist courier service, e.g. UPS/TNT/FedEx/DHL (quote obtained at the point of order query). Which service is used depends on the nature of the item, size, weight etc, as costs can vary considerably and so we will always check costs via a shipping agent and opt for the best value available at that time. We have found that, within the UK, UPS offer the most reliable and efficient service and therefore delivery will usually be through them. At the point of your order we will advise when we expect to be able to dispatch and we will endeavour to keep you informed on the progress of your order. If you have any questions please don't hesitate to ask, our customer service is of utmost importance and we are always happy to help! When placing custom orders for bespoke, made to measure items please be aware that payment will be required in advance of order/lead time confirmation (once you have confirmed you would like to proceed with an order, a link for purchase will be forwarded to you for your convenience). This is simply to enable the purchase of necessary materials and ensure that the correct work time can be allocated to your order. In the case of bespoke items where an exact colour/ shade of fabric is required to fit in with existing decor/ furnishings it is recommended that samples be seen before final fabric choice is made - please do ask about this and we will be very happy to arrange samples for you. What is the average lead time on made to measure items? What materials are used in the construction of the French mattresses? An inner foam core of medium density upholstery grade foam with an additional layer of dacron wadding. Upholstered metal buttons are tufted using upholstery twine and this also creates and secures the hand-quilted mattress edge (except where the outer fabric requires a colour matched thread in which case extra strong thread will be used instead). High quality materials ensure that our mattresses are weighty, comfy and durable. 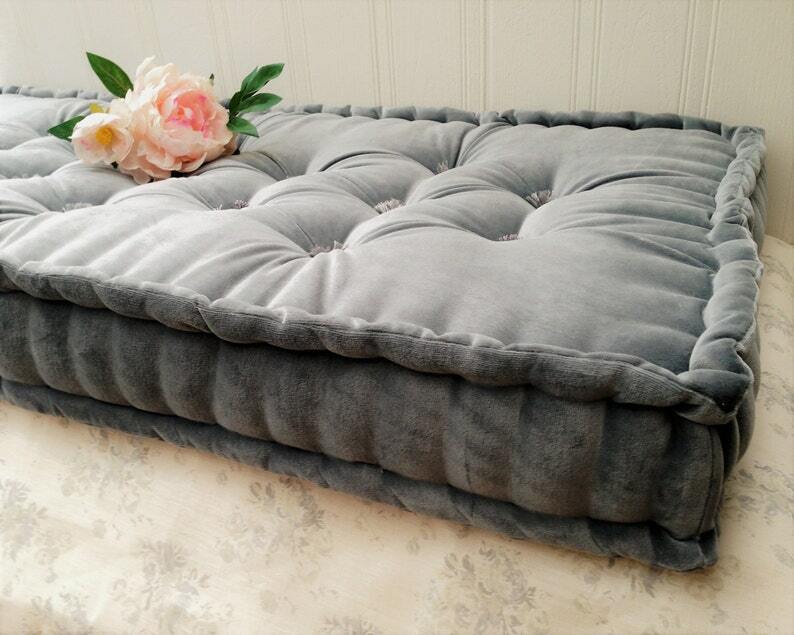 What materials are used in the construction of the tufted pillow cushions? These are lighter weight than the French mattresses, being instead filled (densely) with poly-wadding rather than foam. However, they are still pretty weighty and will withstand plenty of use, as well as looking great!